1. Earnings season in full swing: There's a deluge of corporate earnings reports on Tuesday. Then Capital One (COF), iRobot (IRBT), Six Flags (SIX), Texas Instruments (TXN) and Wynn Resorts (WYNN) will report after the close. Two big trends to watch relate to US tariffs and taxes. Investors are watching for what companies have to say about President Donald Trump's steel and aluminum tariffs and how they could affect their bottom lines. They could also discuss the corporate tax cut enacted late last year. 2. Spotlight on Spotify: Music-streaming service Spotify (SPOT), which recently went public, is expected to make a big announcement at 9 a.m. ET. Experts have suggested it could unveil its first hardware device; possibly a music player for the car. 3. Questions for Wells Fargo: The embattled bank is hosting its annual meeting starting at 11 a.m. Angry shareholders and activists are expected to call on Wells Fargo (WFC) to change its ways. Critics point to a string of scandals — millions of fake accounts, unwanted auto insurance and needless mortgage fees — as proof that Wells Fargo needs to be broken up and CEO Tim Sloan should be ousted. The meeting comes days after the bank was hit with a $1 billion fine for auto lending and mortgage abuses. 4. Economics: French President Emmanuel Macron has landed in Washington, where he will meet with Trump and attend a state dinner on Tuesday. Trade, tariffs, and Iran are on Macron's agenda. Europeans are counting on Macron to persuade Trump to change course on his plans for US tariffs on steel and aluminum imports from the European Union, which are set to take effect on May 1. The US Conference Board will release its latest consumer confidence index for April at 10 a.m. The Census Bureau releases new home sales data from March at the same time. The monthly S&P Case-Shiller home price index is out at 9 a.m.
5. 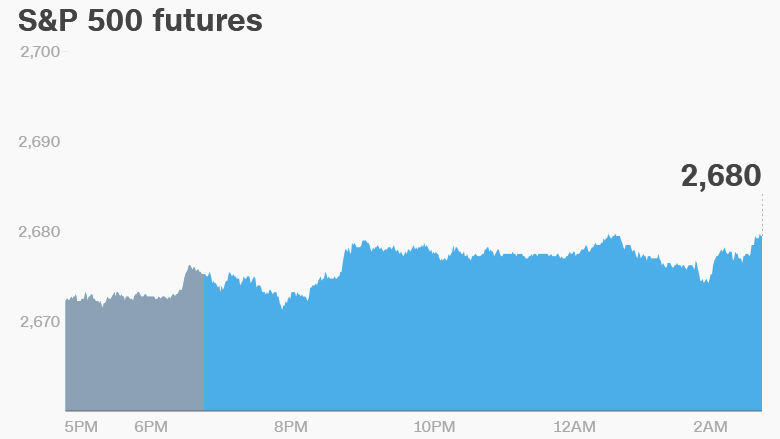 Global market overview: US stock futures pointed to small gains at the open. European markets were mixed in early trading. Most Asian markets ended with positive results, with two key indexes in China surging by about 2%. Crude oil prices increased to trade around $69 per barrel. Yields on 10-year US Treasuries pulled back to 2.96%. Yields have been flirting with 3%, a level that hasn't been reached in more than four years. The Dow Jones industrial average dropped 0.1% on Monday, the S&P 500 was flat and the Nasdaq dipped 0.3%.